Spring past us a week ago, so this is the perfect time to prepare your garden for Spring. Follow our tips and this will bring you benefits for the whole year! This is the easiest time to clean it, because there is barely vegatative growth in early spring. Gather your leaves together and use them for compost. If your Spring blooming flowerbulbs are burried under the snow, don't worry because mother nature will correct itself. When blooming is over, you can extend the bulb life by taking the old flower off just under the bloom and let the foliage die the natural way. This will make the nutrition go back to the bulb and this way it will restore the strength for the years to come in blooming season. it is easy to remove your weeds now, because the roots are at this time very shallow. Cover the empty spots with mulch to prevent new upcoming weeds. We've still got a nice selection of Dahlia's, Lilium, Elephant Ears and more flowerbulbs! 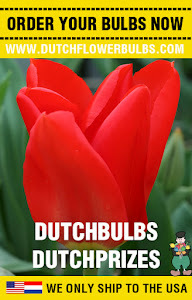 For direct shipping, now is the time to work on your summer garden and plant the summer blooming bulbs! If you follow these tips, you will have in the summer a beautiful colourfull flower garden!